If there is one food that I love and wouldn't be able to live without, it would have to be bread rolls. When I was a little girl, they were a staple around the house and Mummy was an expert at creating different flavors and fillings to entice us. Sometimes she would stuff it with chicken and vegetables. Other times it would be smoked shredded beef. Often she would delight us with a nutella filling. I loved the anticipation that came with taking my first bite, waiting for the flavors to explode and discovering a new filling. Now that I have a little girl, the similarities between us are striking. It seems she has a love of bread just like her Mummy. 'With butter?' she'll ask? Yes, bread always has to slathered with copious amounts of butter. And of course, the butter has to be soft and room temperature! Otherwise, she has now learnt to hold the little butter packets tightly in her palm to get them to soften. Smart girl, isn't she? Although this isn't my Mummy's recipe, Maryam loves this soft pillowy bread roll that my friend makes. 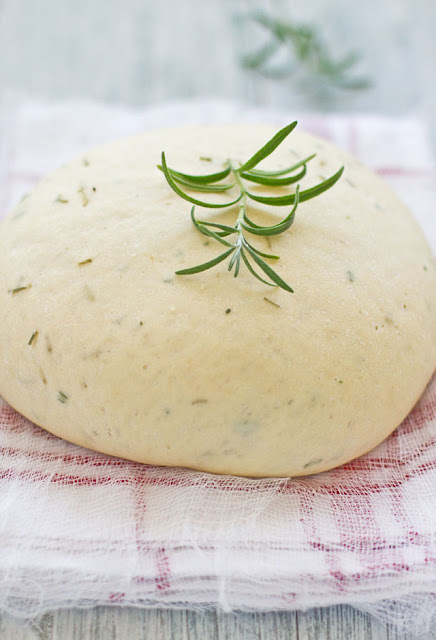 It's certainly a roll with character- scented with fresh rosemary and garlic. I chose to fill it with an Arabic cheese called Kiri cheese (a type of cream cheese) and added some chili paste for the adults. Just like my friend does. As the roll bloomed and baked and scented the house with rosemary, I waited. And waited. And tapped my fingers. And imagined sharing this flavorful and fluffy ball of goodness with Mummy. Would she approve of this new filling? I think so, no? Bread rolls make a regular appearance on our Iftar tables- they're easy to make, can be prepared in advance and small enough to be eaten as finger foods. Would you like me to share with you a chicken bread recipe next time? And now on to the giveaway. Well, it's a rather special one. Earlier this year, I bought a ticket to attend the Food Blogger Connect in London UK from 12- 14th August. There will be renowned speakers including Jaden Hair of Steamy Kitchen and Todd and and Diane of White on Rice Couple. The ticket also includes a special pass to attend a food photography and styling workshop with Beatrice Peltre of La Tartine Gourmande. Due to personal circumstances, I won't be able to attend. So I'm giving away one ticket worth nearly $600 to a lucky reader. This giveaway has not been sponsored by any company. You are responsible for your own travel and stay to the venue. This giveaway is open to readers worldwide. More information about the venue and speakers can be found on the Food Blogger Connect website. Good luck. The giveaway will end on Tuesday 9th August at midnight. One winner will be selected at random from a valid entry. Be sure to leave an email as I will be emailing you straight away to pass you the ticket. You will need to claim the prize within 24 hours or another winner will be chosen. Mix the first six ingredients into a large mixing bowl and whisk to combine. Add the margarine and mix the dough till it resembles breadcrumbs. Add enough warm water to form a soft and pliable dough. Knead for 10-15 minutes. Cover the bowl with a towel and leave to rise in a warm place for an hour or until double in size. Preheat the oven to 180 degrees Centigrade. Turn the dough out onto a lightly floured surface and divide into four equal balls (if you want larger rolls than mine, you can divide it into 3 balls). Roll the ball into a disc that is a 1/4 inch thick. Using a pizza cutter, cut the dough into half horizontally and vertically so that you have 4 triangle. Cut each triangle into half again so you are left with 8 triangles all together. Take a triangle with the widest side close to you. Put about 1 tsp of the cheese (mine were pre cut into small rectangles) and a few drops of chili paste. Roll the triangle up towards the tip (the narrowest side) and tuck the tip under your crescent shape. The ends can be twisted inwards to give the same shape as above. Place on a baking tray. Repeat with the other 3 dough balls. Cover the baking tray with a clean cloth and let the bread rise again for 30 minutes. 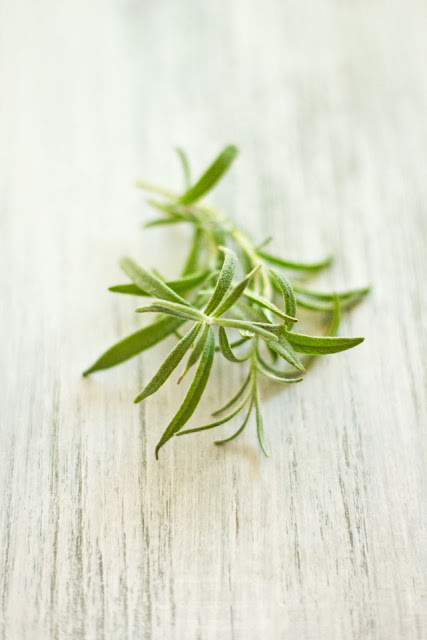 Once risen, brush with egg yolk and sprinkle the remaining rosemary. Place in the oven for 20 minutes or until golden. Serve immediately. You can vary the herbs and filling to your liking or just make the rolls plain without a filling. Here is a helpful video tutorial to shape the bread in a crescent (although I didn't find it necessary to make the small slit at the beginning). That chili paste filling makes me crave for these bread rolls. And the pictures are gorgeous. I don't know which one to look at and I have been scrolling up and down. Your rolls are gorgeous!!!! When I saw the word rolls in your post title i pictured something different, but your croissant style rolls are beautiful. Yum! What a wonderful giveaway! Wish I could enter, but it would probably cost $5,000 for me to fly to London. Boo to living so far away. Its 3 am & I m at airport to catch flight back home..cant tell you how happy few of these rolls would make me right now..I m soooo hungry and want something home cooked..lovely pictures! Those breadrolls are so pretty and look extremely scrumptious! Yummy. As usual, your pictures are exceptional. 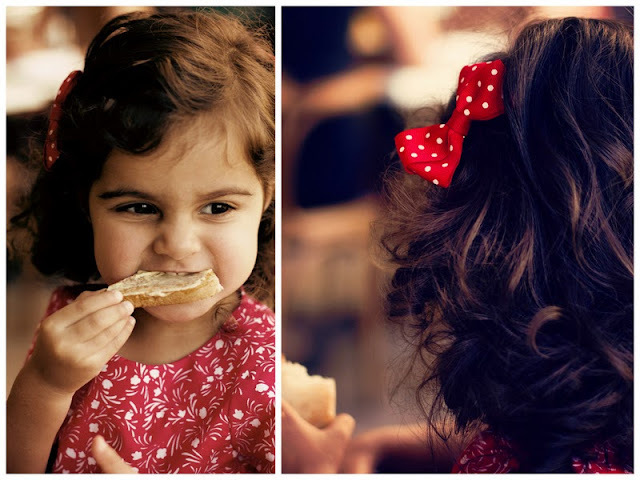 One fancy rolls and your daughter is so cute!! I have liked you on twitter! Very generous giveaway. Your daughter is adorable. And I have tweeted you! such a generous giveaway Sukaina! how come you won't be able to make it? I liked and followed you anyway :-) I love you photography! so beautiful! These are perfect crescents! I love the chili paste. Lovely giveaway but I can't afford to go either since I already have tickets and arrangements to attend IFBC in New Orleans last weekend of August. Love the filled bread rolls and I have got to make some! Wonderful photos, as usual, and your daughter kills me she's so cute! Bookmarking this Sukaina. I love baking bread and the home baked bread is the best to have. The rising of the dough and the smell of fresh baked bread is therapeutic. Spicy cheese is what I love and this has my fav. herb. everything I like. LOVE IT! I see the princess got new crocs :) these are super cute too! What a beautiful little girl! And what a delicious recipe. As my day gets closer to sunset I am ogling pictures of food - very un-Ramadan-like, yes? But seriously, these look delicious and I am printing this recipe out for sure. Am also following you on twitter. p.s. Just discovered your blog today via twitter, and I love it! Will definitely be browsing through your archives. 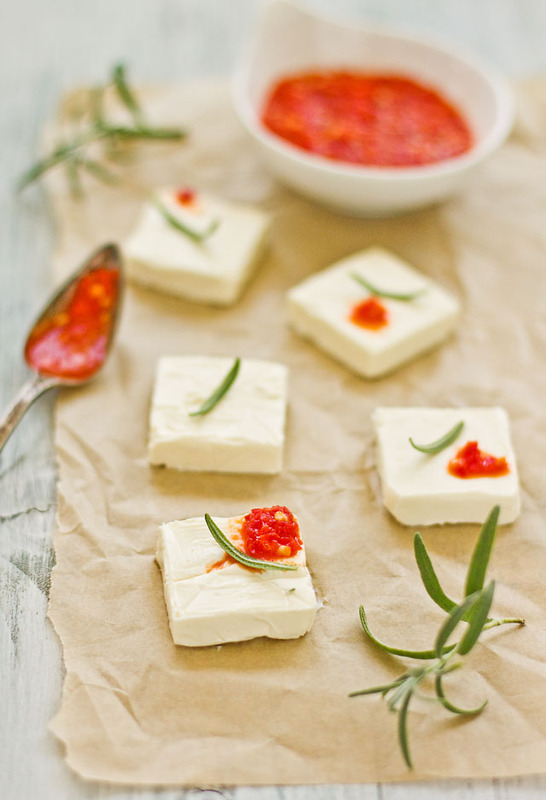 That food blog event sounds amazing & you are awesome to share your ticket with a reader! These bread rolls look amazing. Your little girl is precious! Your posts are getting prettier & prettier ... and more delicious by the day. Sorry you can't go for FBC... sigh! The little poppet is the cutest...and these rolls the yummiest. 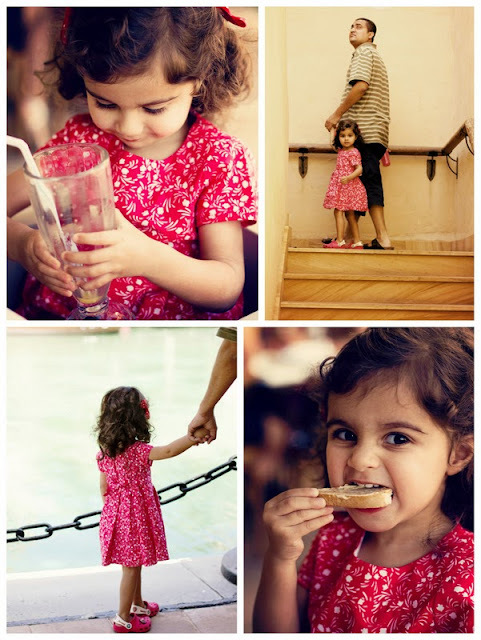 What a lovely post and the pics of your daughter are exquisite! I have printed your recipe and it has gone right to the very top of my must try recipes. Best of luck to all of your entrants to win your wonderful giveaway. Im already subscribed by email and just popping to facebook now..
And you are officially facebook liked too! I have tweeted about the giveaway! ...and finally on facebook! Many thanks! Wow,these are looking delicious!! What a fantastic giveaway!! I, too, can't live without a good dinner roll. 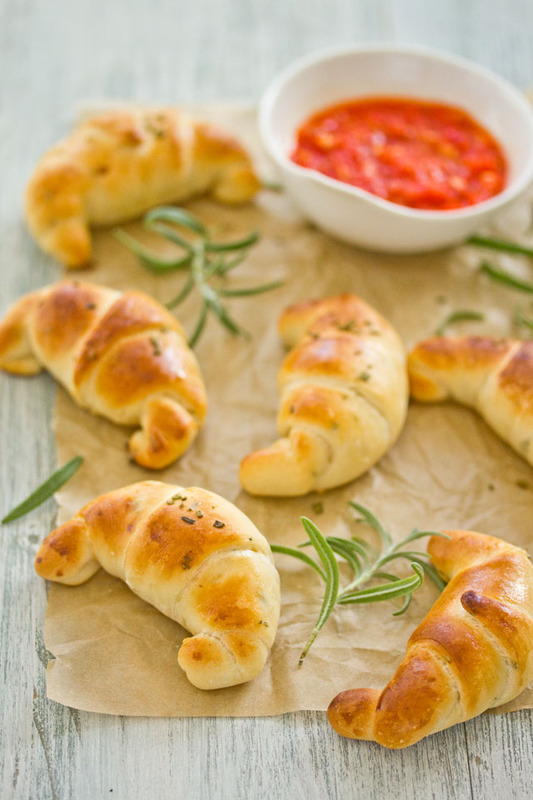 Love those beautiful crescents! That is one generous giveaway Sukaina. As always I got lost checking out your pictures. You daughter is so cute. 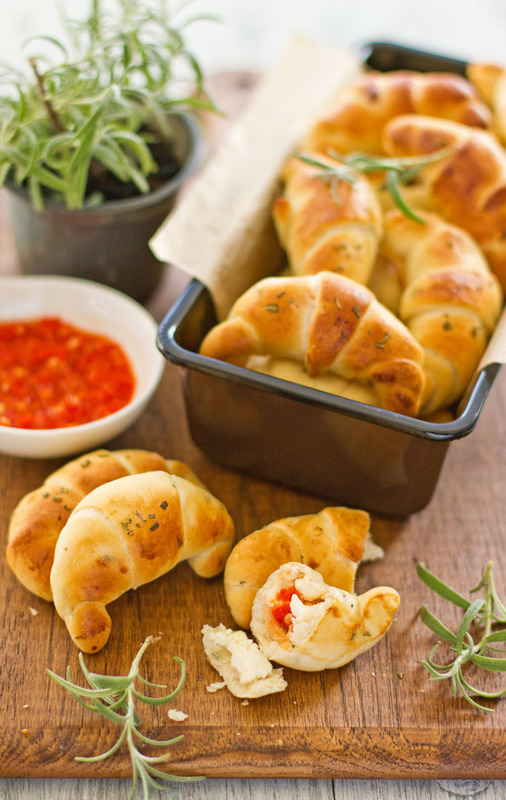 The bread rolls look amazing, sound super delicious and tempting. Your girl is a doll!! These rolls look amazingly delicious!!! Really pretty pictures. Thanks for sharing the recipe. delicious!! I LOVE bread rolls and just this past week I've been looking for a recipe- this seems perfect! And fingerfood like this works wonderfully for iftar. Woah - I have followed, tweeted, liked and subscribed to your email list and now I'm going shopping and I'm making what may become the most awesome thing I will have ever made in my LIFE - those bread rolls are just... wow! haha i follow you on everything, but you don't need to enter me in the contest - i can't go, though i would absolutely love to :) just wanted to thank you for these beautiful photos - i can't wait to try these rolls out! This looks delicious. I make similar bite size versions stuffed with feta, but adding the chili paste is a great idea that I will certainly do next time! Sad you won't be there. Lovely rolls. What a gorgeous blog you have! Ur daughter is very cute! and these rolls look amazing! I love this recipe! Lovely photos! What a lovely blog you've got.Your pics are amazing.I live in Dubai too and just started my blog.Would love to connect with you all. OH my..... The bread looks soooooo good!!!! They look so soft and flavorful. I wish I can have a bite right now! Thanks for the great recipe. The rolls look wonderful! Beautiful photos! Just found your website and love it. 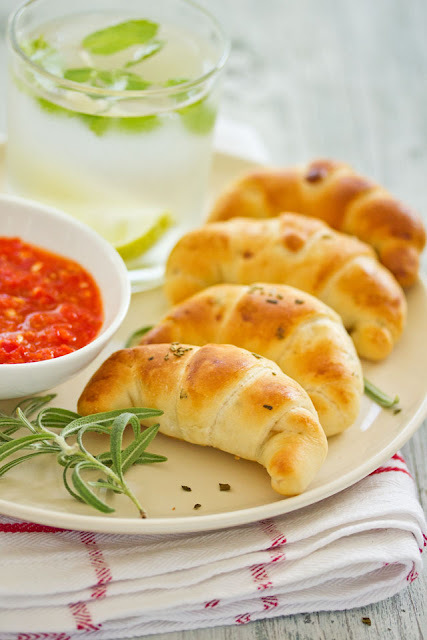 I am definitely going to try these rosemary bread rolls and am looking forward to the chicken ones. I love finding new recipes. I was thinking of making them for a picnic and so they would be cold??? I wish I had found your site sooner as I would have entered the competition. I live about an hour away from London. We have Kiri cheese in France too! I love it. These rolls look amazing, wish I could reach out and grab one! You have a beautiful website Sukaina . The pictures are awesome & am sure the recipes will be very scrumptuous too. Will surely try some. Hi Brieyeh. You can contact me on sipsandspoonfuls@gmail.com for rates about using my images. Thanks. Homemade bread is the best! 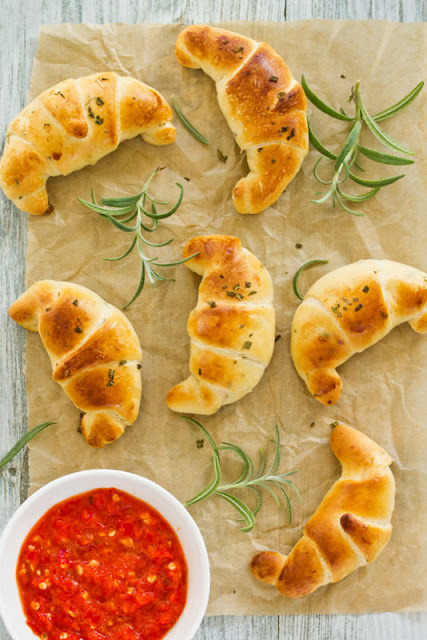 These bread horns look lovely. So are the photos. Hi, the bread rolls looks so good!! how much warm water did you put? hi inbalsweets- I don't have an exact measurement unfortunateluy. i just start slowly and keep adding until a soft dough forms. Next time, I will make sure to take a measurement and update the recipe. Datangkan Lebih Banyak Pengunjung di Website Anda Dengan Berada di Halaman 1.